Hello tea cups. This is a small, small collection. I got my first one (the pink flower on the left) thinking it was actually sort of kitsch and wanting it for just that reason. 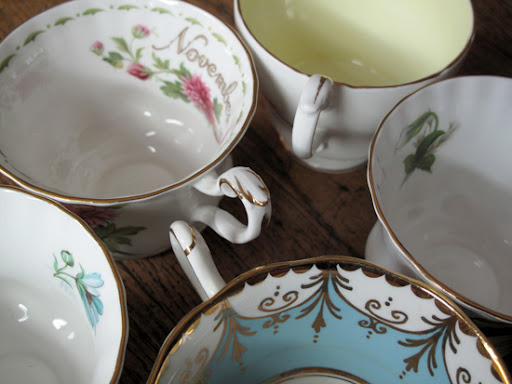 But I fell in love with it and the idea of having dainty tea cups (because I'm becoming noticeably girlier every year). So I continue to keep an eye out for them at thrift stores and flea markets. The Royal Albert company has been around for a while, of course. It is now owned by the Royal Doulton Company who actually still sell some of these tea cups. I believe most of these I have are from the 1970's (though the blue inside one is likely earlier, late thirties perhaps). Actually, one isn't even Royal Albert, but it fits in the collection, I feel. 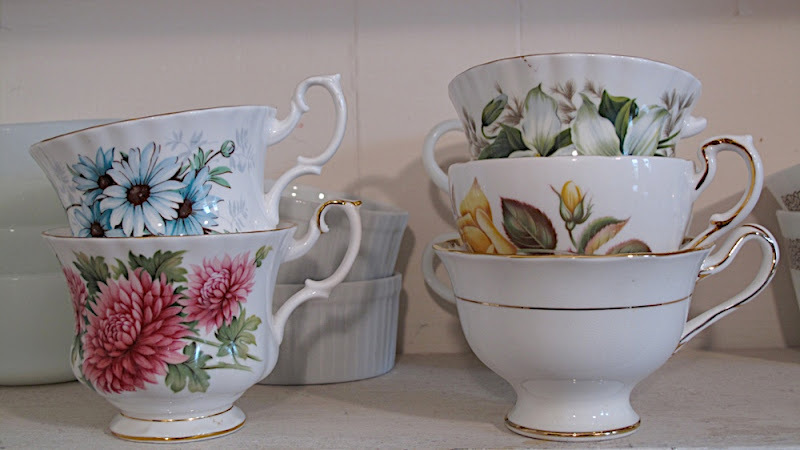 They are not incredibly valuable; a cup and saucer usually sell for about $15-$20 - I don't have any saucers. I just enjoy them and pick them up for a dollar or so. My favorite, with the blue inside, was fifty cents! Here are the insides of the cups and the marks on the bottom. There is a great resource for the marks here. I love them, and I'm at peace with my girliness (16-year-old me would be shocked). I inherited my grandmother's tea cups and sets. I think tea tastes better from tea cups. I just found your blog through Darling Dexter and I've been reading it all day...I love it! !